Canadians disgusted by perks, luxuries for our ‘leaders’. Ostentatious misuse of privilege and entitlement is corroding our faith in Canada's most important institutions. The wealthy and powerful few who run things live in a world most Canadians can't fathom, a world of perks, parties, bonuses, honoraria, expense claims and luxuries beyond the imaginations of most of us at our most covetous. Every once in a while, the veils drop. Right now, what's on display is pretty shocking. The news on Senate expense claims keeps getting worse. Pamela Wallin says she got direct guidance from the Prime Minister's Office. Mike Duffy apparently demanded a Cabinet post without portfolio, and a driver. An appalling picture of arrogant greed emerges as evidence mounts. 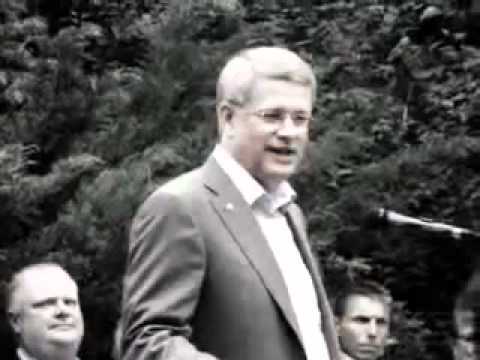 Stephen Harper praises Rob Ford at a 2011 barbecue, asserting they're on the same side. Many Canadians will not be satisfied until some of the current crop of senators go the way of former Liberal senator Raymond Lavigne, a symbol of entitlement and privilege from the last regime. Last week, after a six-year fight, he was sentenced to six months in jail for breach of trust and defrauding the Senate, for filing phony claims and using Senate staff for personal projects like tree cutting. At this point, it’s questionable whether Toronto Mayor Rob Ford will still be out of jail by the time the next election comes around. The tab for Liberal Senator Mac Harb's false claims has nearly hit a quarter million dollars, according to last week's reports, which Harb disputes. Meanwhile his leader, Justin Trudeau, has backed away from previous comments that he'll happily take Harb back into his caucus when the dust settles. Now Trudeau has qualified his remarks, saying he'll take Harb back if he's not charged criminally. That's sort of like saying he'll be welcome back if he really doesn't deal crack (see below). Trudeau, however, is himself again ensnared in controversy over speaking fees of up to $20,000 he accepted from charities while sitting as an MP. Under heavy public pressure, Trudeau is now suggesting he will refund at least some portion of his speaking fees to the charities. In doing so, he seems to be saying, in effect, "I'm sorry, I didn't realize that pocketing $20,000 in fees plus airfare would put your charity in a bad way." This shows how out of touch the man is. Living in and coming from a world of privilege and entitlement, he couldn't see that taking big fees when already on the public payroll might be objectionable, even if the Ethics Commissioner approved it. He would have been better off asking that all his speaking fees should go to a favourite charity or important cause. Then there's Toronto’s mayor, who has famously appeared in a photo with two alleged crack dealers and a man later found murdered. Of course, the alleged video showing him smoking crack has mysteriously gone missing — but hard evidence leads quite directly to Rob Ford. Ford is the epitome of privilege, feeling he can do anything, say anything, get his way on everything and bulldoze anyone in his way. He may not be able to do that much longer. At this point, it's questionable whether he'll still be out of jail by the time the next election comes around. Montreal mayor Michael Applebaum has the same problem, having been arrested earlier this week on corruption charges. The list goes on. No wonder Canadians are alienated by politics and reluctant to vote for any politicians at all!